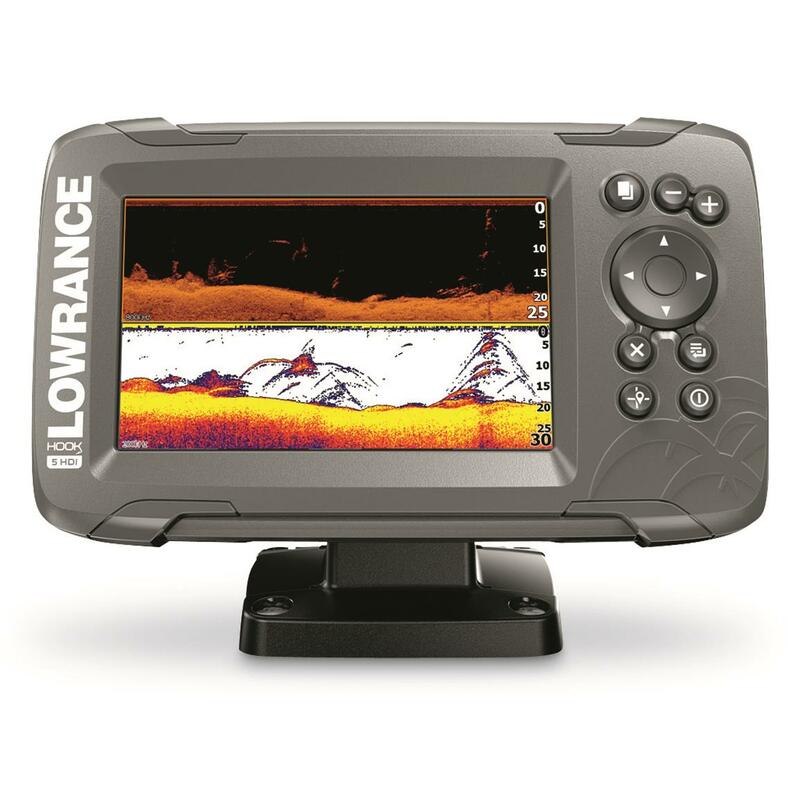 Get double the coverage and half the hassle of other fish finders with a Lowrance® HOOK2 5 Fish Finder with SplitShot Transducer. Extra wide sonar coverage returns bigger arches to see fish as well as track lures and bait as move through the water. SplitShotTM Transducer puts High CHIRP and DownScan imagingTM returns on a 5" SolarMAX display with excellent daylight clarity and visibility. 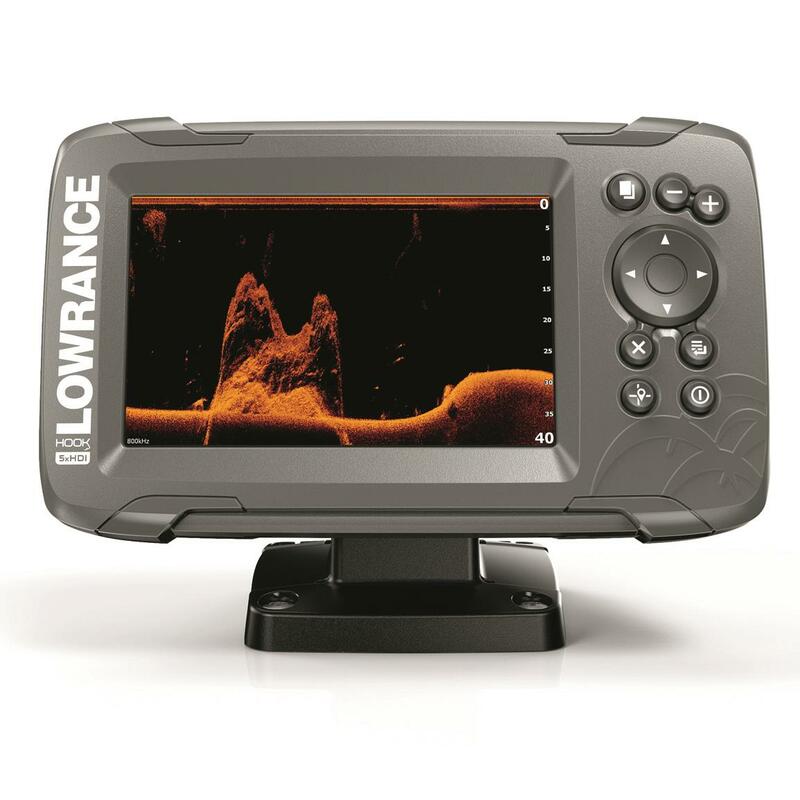 Autotuning Sonar actively adjusts settings as the conditions change to let you concentrate more on fishing. Simpler menus and easy-access key functions get this unit from the box to your boat and finding fish in minutes. Lowrance HOOK2 5 Fish Finder with SplitShot Transducer is rated 4.4 out of 5 by 80. Rated 4 out of 5 by Superyakman from Awesome product for the price Product does have good versatility with a nice screen. Rated 2 out of 5 by Ray777 from Beware Not As Easy As Advertized Purchased a Hook2 -5 a few months ago and it is not as easy to use as they say it is. It doesn't bring an operator manual, one has to download or print it, 92 pages. Rated 2 out of 5 by FishTool from Pros and Cons I've had this unit (Hook2 5 w/ Split-shot transducer) for about a month. Here are what I consider improvements from my old Hook 4 unit:+ The maps are much better. I fish in Southern California and there are multiple MPAs that we need to be aware of. The newer maps have these marked out so I didn't have to input their coordinates with waypoints.+ I like the larger screen so having half of it dedicated to charts and half dedicated to the FF works fairly well.+ The UI in general is easier to use. However, it is very different from my old unit so I needed to learn how to do some of the functions I could do blindly on my old unit.+ The interface cables (power and sonar) are smaller and do not need to be screwed in. I believe this makes them more waterproof, but I can't be certain.+ The display is easier to read in bright sunlight.Here are points where I believe the product regressed:- The trip calculator is WAY off. I'm a kayak fisherman and I spend several hours on the water at a time. I really want to know how many miles I put in after each trip. The old unit, seems to use the same logic, the menus are similar (if not the same), and after taking a route I've taken for years and know that it's roughly between 8 and 9 nautical miles (depending on current or if I'm fighting a fish etc), this new unit says the same route is between 2 and 3 miles. This is curious because the trail on the map is very accurate. I tried removing the time setting because I have a watch, I'm just interested in the distance traveled. This had no effect. I spoke with customer service and received and email that suggested I do a soft reset of the unit. I tried this and it didn't fix the issue.- When you go to the trail editor, it doesn't provide any statistics on the trails you've created. It would be really nice if they could provide data such as how long a given trail is, when it was created, how many waypoints were created on the trail, etc.- When you go into the menu that provides tide data, you get stuck until it can read the tides. This is painful because you have to go past this setting to go to the "info" section so this is never fast.- The depth reporting is less accurate than my old Hook 4. Fishing in La Jolla you'll traverse some very deep canyons and the unit just blinks if you get into more than 200 feet of water. This is annoying, but not a show stopper because I usually don't fish those deep spots.- The boot time on this unit is just as slow as the older unit. I don't understand why this takes so long.I'm a software engineer who works in wireless technologies such as GPS and other communication protocols. I know to fix the problems I mentioned should be relatively easy. If these were addressed, I would give this a much higher rating.I would be happy to discuss with a Lowrance/Navico product engineer or tech. Rated 5 out of 5 by FishinJack from Great for Kayak Fishing! Installed on my Hobie Fishing Kayak and worked great, Kayak is rigged to support Lowrance transducer, perfect fit, nice size for kayakers, easy to use, doesn't require much hands on so I can just fish! Rated 4 out of 5 by Dino from Really like it! I bought my Hook2 5 to put on my my kayak. At first I wasn't getting how to use but after watching YouTube vids on how to setup I'm much happier and have a better understanding now. Really like it. Rated 5 out of 5 by Bv05 from Great product. Would recommend it to any and everybody i know. Rated 3 out of 5 by bigfish44 from Good product I purchased this unit in February and it is a ok unit for the price. The fact you just turn it on and you don't have to do anything is nice. If you want to get the most out of the unit there is a learning curve. And some of the settings are not discussed in the instructions. I had google the information. And about three months in it stopped reading the water temp. Rated 5 out of 5 by BAK1 from Bought and had installed on new Sun Tracker pontoon. Works really well.